Vereniki Goneva (left) in action. Fiji Airways Flying Fijian winger Vereniki Goneva is one of the most skillful, fast attacking and hard-hitting rugby players in the world. The Nadogo, Nadi native won numerous rugby awards including the Aviva Premiership Player of the Year and was also the joint top try-scorer in the Premiership with 13 tries in 19 appearances in the 2017-18 season. As our local boys playing in the European Championship head into this second half of the 2019 season, we had a Q&A session with Goneva on his season so far and the upcoming Rugby World Cup. You have scored a total of five tries this season – How do you feel the season is going both for you and for Newcastle? This season for Newcastle has been tough with many injuries, still few games to go but still enjoying my time here with Newcastle within rugby and outside rugby. 2.What is your main aim for 2019? My main aim is to keep fit and healthy mentally, physically and most of all spiritually. What (if any) are some of the challenges you’ve faced in the season to date? I think for us islanders maybe, or for me is trying to control my diet. We love food but when it comes to staying fit and keeping healthy it is important to maintain a healthy diet. 2018 was a huge year for you, with many personal and team achievements, what was your greatest highlight? The greatest highlight of my 2018 was when we beat France during the November Tour. We are watching you do some great things on the rugby field for your Club and for Fiji. What motivates your performance? My greatest motivation is my family. My humble beginnings, looking back on the struggles I went through has shaped me be the person I am today. I am forever thankful to GOD for my family. 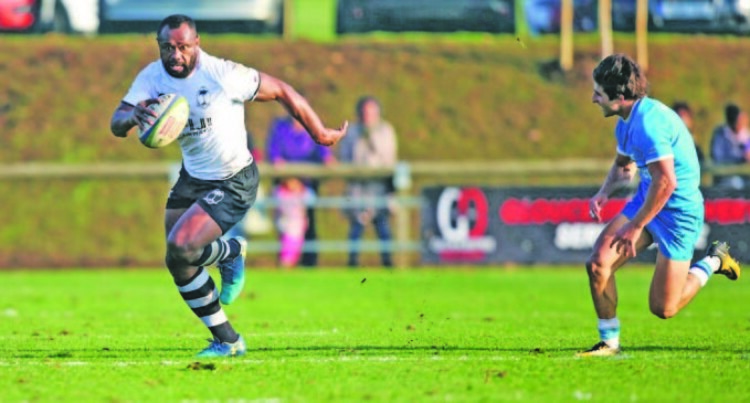 The historical victory over France was significant for Fiji as a country on the world rugby stage but also for the players to know they can beat a Tier 1 nation in such positive style. How do you think that game has affected your personal outlook and that of your teammates? That game showed the confidence and courage from the boys. We have boosted our confidence from win against France and the boys know that it doesn’t end there, we have to keep focusing on what is ahead of us. That game is behind us now, we carry on the positive and we learn from the negative, move forward try make it better mentally and physically with in the team. There was a lot of talented and young players in November tour squad and I’m truly blessed to be among them. Fiji now sits at eighth in the world and we’ve got the RWC just around the corner, how do you feel the French game and then this year’s World Cup will affect 15’s rugby in Fiji? This year is a big year for Fiji Rugby as the world cup is being held in Japan. Fiji is confident of beating big teams and achieving what they can achieve in this year’s world cup but the boys know that we need to work hard and focus on staying fit going in to the preparations for PNC and RWC this year. Flying Fijian winger Vereniki Goneva is among the topfive most offloads this season in the Aviva Premiership Championship table. Goneva is sitting at fifth in most offloads which also featured Taqele Naiyaravoro who is at the number one spot. The flying Fijian powerhouse wing covered a total of 419 meters in this seasons premiership and has beaten 37 defenders and got 13 total clean breaks altogether proving that he’s still got the speed and agility even at age 34. He has a total of 46 most passes and 15 offloads which kept him in the fifth spot for the most offloads. Coming up with 19 tackles and scoring a total of 25 points and has scored 5 tries all together in this seasons Aviva championship. Goneva was also part of Flying Fijian Historic win over France in Paris in the November Autumn tour where he scored a try which was than not awarded, and also he set up a try for fellow winger Josua Tuisova.